← Melissa Smith – Writing Out of Grief. I don’t look at a date on the calendar to tell me when spring arrives. Spring arrives when the first wild onion blooms in May. But Mother Nature fooled us. Wild onion bloomed the middle of April and is already dying. 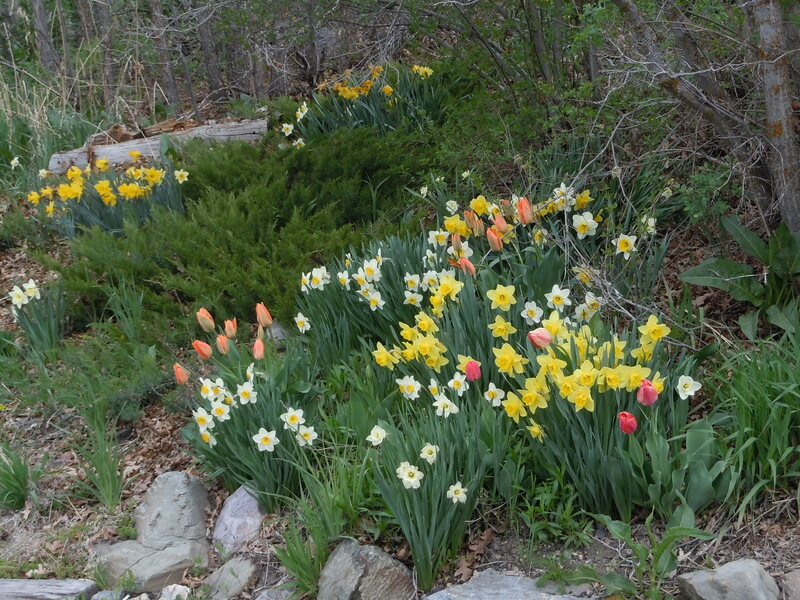 Normally, snow is just disappearing from the bottom of the driveway and snowdrops and daffodils are poking from the soil. 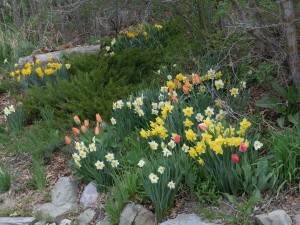 Now, daffodils, tulips and hyacinth in full bloom are rioting down there. Perennials seem to sprout up overnight. And the damned weeds. Mother Nature has disrupted my schedule. I’ll have to get out and work on the garden soon. Not to mention doing something about the state of the house. In Demon on a Distant Shore, Tiff Banks waxes lyrical about sunshine. “Sunshine is marvelous, not only because we need it to survive, but for how it makes us feel.” Right now I’m cursing the sunshine. It cheerfully illuminates the dust, grime, cobwebs, dirty windows and all the trash the animals bring inside on their furry bodies. So spring cleaning is also in the works. I hate anything that takes me away from writing, but real life can’t be ignored. Fortunately, I’ve just finished my first edit of Mindbender, so I can take a break and attend to some of the mundane stuff. Mindbender is my first love, my first book. Published in 2008, I unpublished it when I realized my writing was less than satisfactory. Then Whisperings distracted me, but I’ve always meant to get back to Mindbender. It’s soft sci-fi/fantasy. You won’t find any highly technical scientific terms you don’t understand. There are no epic space battles. 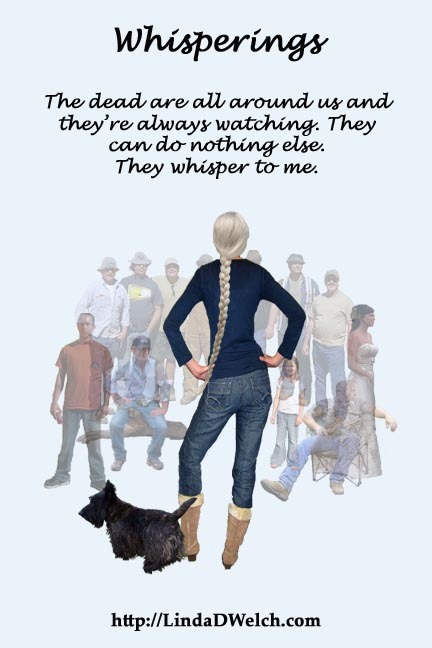 It’s about people who are on a quest that challenges their self-perception and personal values, who are not always correct in their beliefs and assumptions, and if you’ve read Whisperings you know I like to write about folk who are not what they appear to be. I have to go now, gather my mops and brooms, buckets and dusters. If I can remember where I left them last year. This entry was posted in Ramblings and tagged Demon on a Distant Shore, Linda D. Welch, Linda Welch, publishing, sci-fi/fantasy, space opera, spring, Tiff Banks, Whisperings, writing.. Bookmark the permalink. I don’t have dust bunnies, I have dust hares. Hee hee. If we’re into one-upmanship, my dust bunnies aren’t bunnies, they’re cougar size. Like demons and dragons, I am afraid that each of us must slay our own dust bunnies! Can’t wait to read Mindbender, though! I’d rather face a dragon than my dust bunnies! Here’s to the slaying of dust bunnies! I’m heaving a sigh of relief because I misread at first, thought you said “here’s to the slaying of bunnies.” If you enjoy slaying dust bunnies, you can whip over here and tackle mine.